Fresh New Day » Where do you go my lovely? 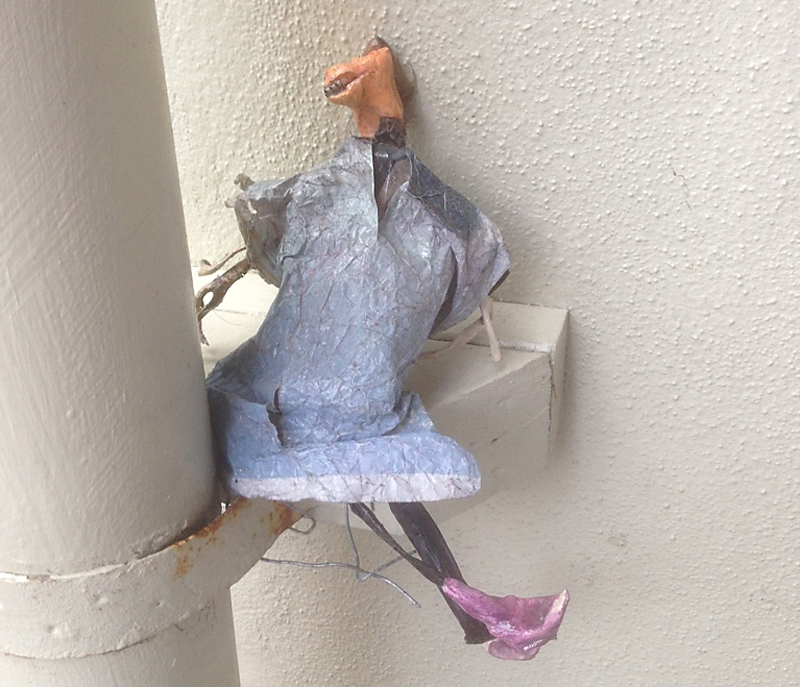 Some creative person leaves these little sculptures in the streets of Wellington. I don’t know why, but they always remind me of Peter Sarstedt’s song about Marie-Claire and her rags-to-riches story. The figures pop up in unexpected corners, in time periods I cannot fathom. I admire the creativity that’s gone into their creation, and I wonder what’s the back story – who is creating them and why, and while I’ve noticed them for some years, how long has this street art work/installation been going on for? I wonder what Marie-Claire gets up to at midnight when all the toys come to life. Does she see herself as toy, a plaything, a fetish object, a voodoo doll, or something entirely different? Where does she go… ? 10. Every day connect with somebody. 09 Jan This entry was written by Lynsey, posted on January 9, 2017 at 9:57 pm, filed under art, constructive action, creativity, everyday skills, exploring, fun, handcraft, love, music, public art, sculpture, seeing, Wellington and tagged art, creativity, Peter Sarstedt, sculpture, story, streets of Wellington, toys, trust, voodoo. Bookmark the permalink. Follow any comments here with the RSS feed for this post. Post a comment or leave a trackback: Trackback URL.